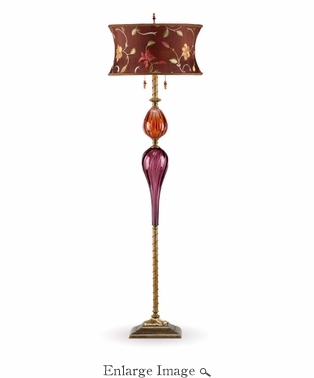 The floor lamp, Victor, features purple and rose colored blown glass and a round shade covered with auberine & brown dupioni embroidered with pink & orange floral design. The solid brass and copper elements are finished with techniques that will ensure they will never chip or discolor. Double bulb socket. Beaded pulls and finial. Total Height: 62" (without finial). Shade is 18" diameter x 10"h. Handmade in USA. All Kinzig lamps are made to order. Please allow 2-3 weeks plus shipping time.